Biomatrices is a meditation on time and landscape. 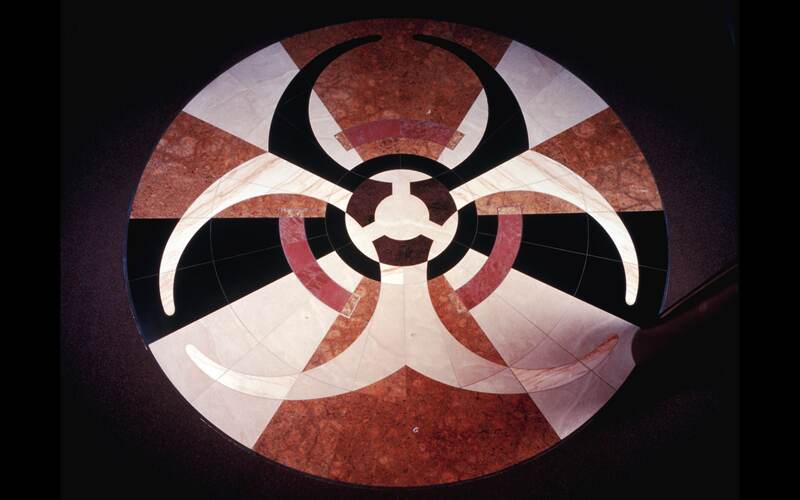 The design of these two stone floor mosaics (literally embedded into the landscape) pair trefoil symbols of biotechnology with Arapaho iconography at the major pedestrian intersections within the facility, forming a visual matrix (ideogram) designating the air, water, and human environments upon which all activities of this facility flow. As an artist, I am deeply interested in how shapes and colors are collected and patterned into a larger symbolic order, capable of transcending their original referents—and even cultures, to become powerful metaphors in the perception of human experience. By combining the radiation, biohazard and infectious substances symbols with Arapaho symbols, I have produced a pair of designs sensitive to the history and landscape of the site in which this work will experienced. The radial symmetry of the organic and geometric shapes in each circle reflect similar structures found in chemical compounds and living cells. 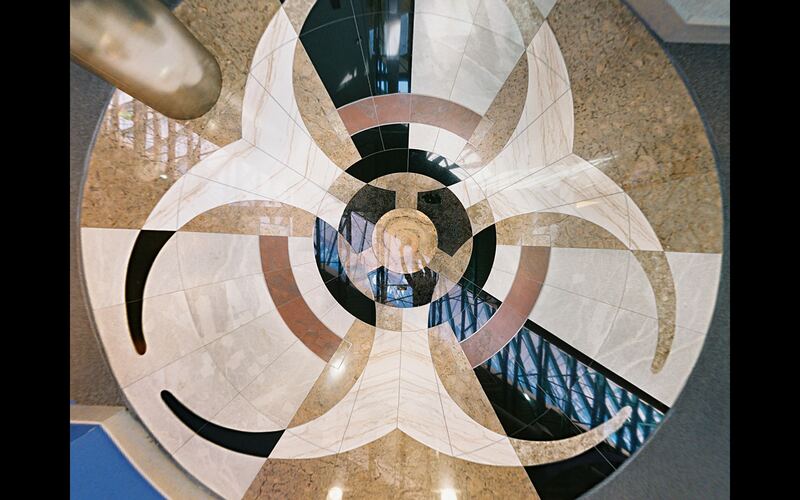 Some of the work performed at the Department of Public Health and Environment includes air quality and blood testing which are referenced by the Arapaho symbols for the heart and lungs in the first mosaic. The second design contains bilateral light and dark shapes offset by a pair of darkened horns of an Arapaho buffalo skull symbol. The cardinal directions are prominent in the outer ring of white marble. The concentric rings symbolize a lake in Arapaho iconography—befitting the water testing performed by the Department of Public Health and Environment. Two 226 sq. 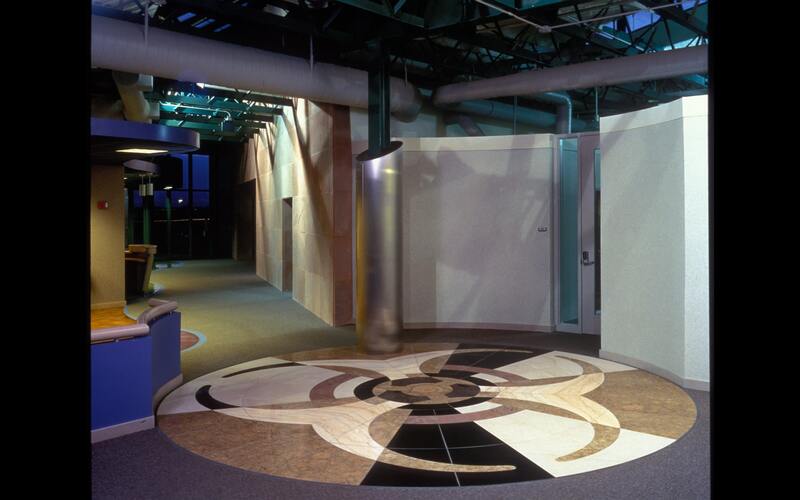 ft. marble, granite, sandstone, and stainless steel public art floors located in the Colorado Department of Public Health and the Environment’s Laboratory and Radiation Services facility in Denver, Colorado.